Access to the gallery at times other than listed above can be obtained by contacting Joshua Estrada in TECH 123, or James Campbell (Bosque Gallery Director) in ART 113G. It is not our goal to act as a retail outlet or commercial gallery, though exhibited work may be made available for purchase. The Bosque Gallery is not available as a rental venue to private individuals or organizations. Group or individual exhibitions will be conducted as “invitational”, with the gallery committee acting as jurors for screening exhibition proposals on a space-available basis. The committee may appoint a guest curator for specific exhibitions. 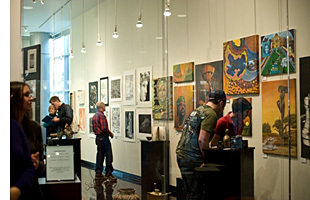 Priority is given to scheduled LSC-CyFair visual arts exhibitions. The gallery committee consists of the full time art faculty and the gallery coordinator of LSC–CyFair. Every year our gallery hosts two student exhibitions, one faculty exhibition and several exhibitions featuring local and nationally recognized professional artists. We also host annual invitationals that feature national and international artists working in a variety of media. Would you like to volunteer as a docent for the gallery? We would love to have you! Please submit the form below and our gallery coordinator will contact you. Include your contact information in the comments section. We value your feedback. Please feel free to leave a comment or suggestion for the gallery using the form below.